As expected, BMW has revealed the new X3 compact SUV. At first glance, you’d be forgiven for failing to spot the difference between the . But this isn’t a minor facelift, it’s an all-new model. While the styling has been subtly revised to incorporate BMW’s new design language, the new compact SUV is 55 kg lighter than its predecessor, and the wheelbase has been extended by 2.2 inches to increase the cabin space. A “three-dimensional” kidney grille and hexagonal fog lights feature for the first time on a BMW X model. A long hood, downward-slopping roof spoiler and twin exhaust tailpipes give the new X3 a more muscular look. Optional Adaptive LED and Icon Adaptive Full LED headlights can also be fitted, and it’s also the first BMW SAV in the US to feature a factory-installed trailer hitch. 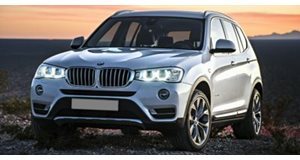 BMW touts the X3 for having a perfect 50:50 weight ratio between the front and rear axle which, combined with its “meticulously honed chassis” and an all-wheel drive system with more rear bias, makes the new X3 more nimble around the corners. Traditionally, the X3 isn’t renowned for its off-road capabilities, but the new Dynamic Stability Control automatically adjusts the power between all four wheels depending on the surface. The eagle-eyed among you may have noticed the new X3 has an M badge for the first time in the model’s history. Powered by a 3.0-liter inline-six engine connected to an eight-speed automatic, the range-topping X3 M40i model produces 335 horsepower and 369 lb-ft of torque that puts it above the . Sprint time from 0-62 mph takes just 4.9 seconds which puts it in hot hatch territory, before it maxes out at 155 mph. Despite all that grunt, BMW claims the X3 M40i will achieve 34.5 mpg. Adding to its sportier look, the M40i is equipped witha sport exhaust, sport brakes, sport suspension, and variable sport steering. As standard, the X3 M40i comes with 19-inch cast light-alloy wheels, or you can opt for 20-inch or 21-inch alloys to give it more presence. In its xDrive30i guise, the new X3 is powered by a turbocharged 2.0-liter gasoline engine with 248 horsepower and 258 lb-ft of torque mated to an eight-speed automatic transmission. 0-62 mph takes six seconds, while the top speed sits at 130 mph. Inside, the driver-focused cockpit mirrors the exterior design with hexagonal forms and sloping lines playing a central role. An array of new comfort features are available as standard, including 3-zone automatic climate control, front ventilated seats, and 40:20:40 split/folding rear seat backrests which can be adjusted individually. Elsewhere, there’s a h sat nav system with gesture control, a head-up display that’s 75 percent larger, and all the driver assists that we’ve come to expect such as Active Blind Spot Protection, Lane Departure Warning and Frontal Collision Warning with City Collison Mitigation.